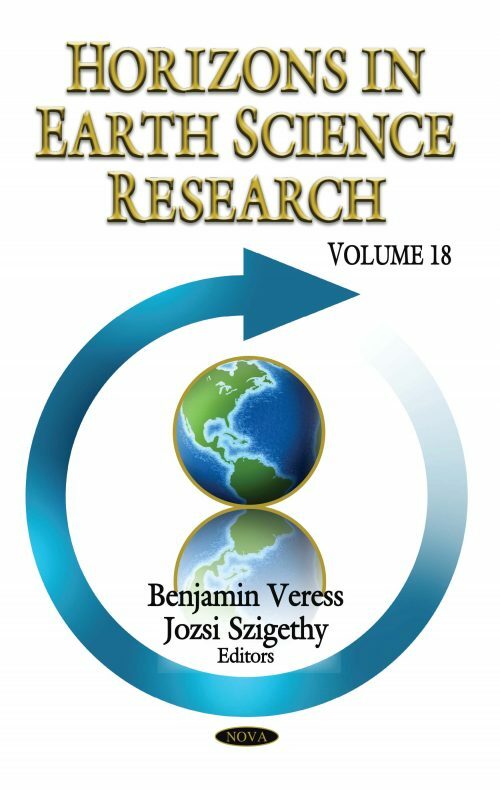 Horizons in Earth Science Research. Volume 18 opens with a chapter discussing the influence of canyons at the nearshore of river mouths on water dynamics and sediment transport, seawater intrusion into estuaries, and erosion-accumulative processes. The mouths of the rivers Congo and St. Lawrence are studied as examples of the effect of canyons of different genesis on estuary formation. Next, the authors use numerical examples to demonstrate qualitatively and quantitatively the variability of the Odum – Pianka ecosystem under different conditions. An analysis of stability shows that the Odum – Pianka ecosystem has two steady states. One of them corresponds to the situation when the total amount of the ecosystem material is accumulated in the mineral nutrition component, and the second steady state is stable and corresponds to the ecosystem equilibrium state. Following this, the authors present depth determination and source characteristics for North Korean nuclear tests using body wave and surface wave spectra. The source depths for the 2016J, 2016S and 2017S nuclear tests were estimated at 2.11 km, 1.99 km and 1.99 km, respectively using spectral nulls of P- and S- wave and Rg-wave spectra. Also in this compilation, ethnography, folklore and historical information is analyzed in order to restore the ancient celestial sphere (with the use of a special astronomy application) and identify the correlations between the megalithic complexes of Shaori Mountain and the Sun and Moon eclipses. Afterwards, a new Modified Levenberg-Marquardt Algorithm (M-LMA), improved from the Levenberg-Marquardt Algorithm (LMA), was used to minimize back propagation errors in training a back propagation neural network (BPNN). To compare this capability, both M-LMA and LMA were used to trace the vertical component of the Chi-Chi earthquake with the same learning rates of 0.3. The results showed that M-LMA generated smaller tracing errors. In a separate study, measurements of in-situ magnetic susceptibility were compiled from mainly Precambrian crystalline basement rocks beneath the Colorado Plateau and ranges in Arizona, Colorado, and New Mexico. The susceptibility meter used samples about 33 cubic centimeters of rock and measures variations in the modal distribution of magnetic minerals that form a minor component volumetrically in these coarsely crystalline granitic to granodioritic rocks. Finally, a horizontal gradient analysis of the isostatic gravity and aeromagnetic anomaly grids of the New Mexico-Arizona-southern California area was carried out, focused on eastern Arizona and western New Mexico, to define the transitional boundary between the Proterozoic Yavapai province to the west and the Mazatzal province to the east. The two provinces differ substantially in their favorability to host Laramide porphyry copper deposits. Chapter 5. Is It Possible for Back Propagation Neural Networks (BPNNs) to Serve as Tracing and Early Warning Tools for Earthquakes by Tracing Microseismic Activity?